The data is far more interesting than the graphics in this infographic and that is usually the opposite when considering any infographic. In fact the on-off buttons are a bit confusing considering the focus is on a Google search and not turning on a computer, but the idea is there, so it is at least tangent to the concept of energy use, especially by a computer. The other images seems to be pulled from various clip art which really gives the piece a lack of cohesion. It very much feels as if it was cobbled together much like Frankenstein’s monster, so while the information is fascinating the actual imagery hurts the infographic’s overall punch. From the infographic, paraphrased: As the world’s largest search engine, Google processes an estimated 13 billion searches every month. 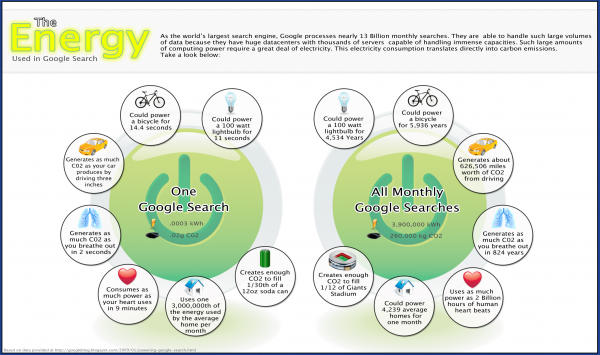 This electricity consumption translates directly into carbon emissions. Here is the amount of energy uses in a a Google search translated into other forms of energy usage. How do Radio-Controlled Clocks Work?